The information regarding the Formation, Consecration and history of the Lord Warden Lodge is unfortunately incomplete. Due to the insurmountable loss due to War damage of all minute books prior to 1932. The Lodge does still have a number of important documents and minute books in its possession, and Members Registers from the 21st April 1866. From these emerges the Patten of over 150 years of Masonic History in Walmer. The petition for the formation of the Lord Warden Lodge was signed by The Master and Wardens of Peace and Harmony Lodge No 199, Dover, and forwarded on the 26th February 1866, to Grand Lodge, with a recommendation by the Provincial Grand Master of Kent, William Archer, Viscount Holmesdale (afterwards 3rd Earl Amherst). Carl Liebermann 784 Deal 43 Wellington Terrace, Deal, Gentleman. William Barlow 784 Deal 40 Strand, Walmer Paymasters Sergt. Richard Moss 555 Fermoy 34 Barracks, Walmer Sergt Major. George Northover 903 Portsmouth 34 Barracks, Walmer Sergt Major. Lodge Number 784, is the Wellington Lodge, with which we share our current Lodge Building. The Warrent was issued on the 28th February, 1866 and signed by Command of the Grand Master, Thomas Dundas, Earl of Zetland, KG KT. The Lodge was allocated the number 1096 and designated “The Lord Warden Lodge”. 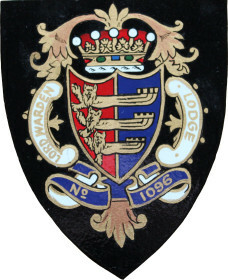 Prior to 1932 when there was a general re-numbering of English Lodges, 1096 was the number of “The Warden Lodge Sutton Coldfield”. Their number is now 794. James Hinton. Age 36 Surgeon, The Barracks Walmer. (Left Walmer on Active Duty, 1867, before further advancement). The Lodge was to meet on the 1st and 3rd Friday every month. The members Register notes that all had paid 2/- for Quarterage to Benevolence, and 2/6 for Register Fees and Certificate in the case of Initiates was 17/-. An Inventory Parchment, now in the Lodge’s possession, lists the Ornaments, Furniture, Jewels, Clothing and other Properties belonging to the Lord Warden Lodge No 1096, to be handed over to the respective Worshipful Master on nights of Installation. (This is now in electronic form). On the Front of the Inventory were written the names of successive Worshipful Masters from 1866 to 1879.